Jeff Nelson with retired F105 located at Pima Air Museum in Tucson, AZ. Jeff Nelson founded Custom Connections of Arizona, LLC in 1986. Jeff's history goes back to his childhood. He followed in the footsteps of his father, Robert Nelson, and joined the Air Force in 1971 where he maintained F105's during the Vietnam War. After nine years of service, Jeff settled in Arizona and began his 18-year career with Motorola, managing teams involved with the design and construction of semiconductor manufacturing equipment. He has been instrumental in the development of start-up semiconductor companies over the past 10 years. 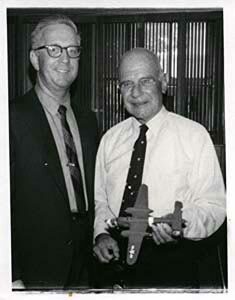 Robert Nelson, left, with James "Jimmy" Doolittle, right. Doolittle was a US pilot and war hero famous as a racing pilot in the 1920's and 30's. He led the first air raid on Tokyo on April 18, 1942 and later became an aerospace executive. Jeff used his 30+ years of experience to combine his love of aircraft and new industrial technologies to start Custom Connections. He takes the techniques learned in both fields and creates unsurpassed quality in both divisions. The industrial division benefits aircraft projects in safety, cleanliness, professionalism, troubleshooting and problem solving. 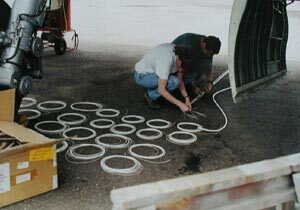 The aircraft division benefits industrial projects by the use of only Mil Spec wire and clamps and specialized wiring techniques resulting in the utmost reliability and ease of maintenance. Military experience in schematics means easy to use and accurate drawings done by Jeff and he includes a full set with every project. 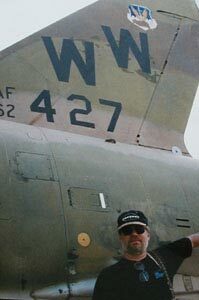 Greg and Tracy Norris, working on B-17G "Miss Angela". Jeff put together a team of trusted and knowledgeable employees including former co-workers he's come to know and respect over the years. He has traveled across the world researching, consulting, and documenting for both aircraft and industrial customers alike. Current aircraft projects include the rewire of a B-25 "Mitchell" and a German Focke Wulf. Current industrial projects include the wiring of controls enclosures for analytical equipment. Custom Connections' mission has always been to strive for the best quality wiring while maintaining the highest level of customer satisfaction. The practice of personable communication and numerous project updates help to build lasting relationships with clients. Those clients know at any moment the status of their projects and consequently come back time and again. Our customers rely on Custom Connections for a quick turn around time, high quality workmanship, and the ability to handle any type of project given them. Our goal is to work closely as a team so finished product is exactly what was intended to be. Please email or call us at 480-924-5600 for more information on how we can better serve your needs.